Back in March I was chosen to be part of a team of parents to trial a new range of organic skincare products from Little Green Radicals. Many of you may know Little Green Radicals for the fabulous 100% organic and certified fair-trade baby and children’s clothing they sell. They started in 2005 and their range has grown from a series of slogan baby grows and t-shirts with slogans like “I recycle my tantrums” and “wind farm” to a beautiful range of clothing which now includes, baby grows, dungarees, dresses, hats, leggings, baby bodies and much more. They have recently launched a great range of organic skincare products specifically for babies and children, two of which have soil association certification at 99.9% organic. Their range includes a nappy balm, sleep balm, chest rub and a petroleum-free jelly. 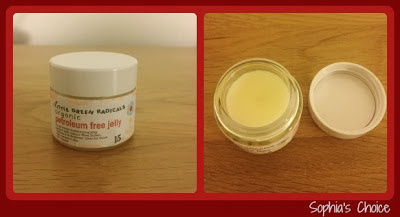 I was given the chance to initially trial the petroleum-free jelly as part of the parent team and then given a further chance to try out samples of the other skincare items. This has given me a great overview of the range and I have to say I’m really impressed. As well as sharing these products and others with you my readers, this journey is also answering some questions about which skincare ranges I would like to stock in my online shop which I’m aiming to launch later this year. Little Green Radicals range of skincare is definitely a contender. I like the fact that the range is not too big, and it covers the main areas you’ll need products for with babies and young children; sleep, colds & snuffles, moisturisation and nappy rash. This was the product I initially trialled for Little Green Radicals and I really enjoyed using it. I like the fact that this balm could be used for lips, body, hands; basically any dry or irritated areas of the skin. It took a while to get the balm to soften in the pot but once the balm had been used a few times it was easy to use and was great at moisturising the skin. I also used it on my lips at night and it really worked at keeping them supple and hydrated in the night. My youngest loved putting it on herself too and I had to place the pot out of her reach in the end as she loved using it too much ! The pot was likely to disappear completely especially when she started using it on her teddies ! This balm is a fabulous texture for applying to delicate little bottoms. I love the consistency and it sinks into the skin really well. If you’re looking for a product which isn't a thick cream but a soft balm which protects the skin, then this is well worth looking at. It has a gentle, subtle fragrance so not overpowering in anyway. In fact the whole range smells really natural and full of goodness. The essential oils used come through but are not overbearing in any way. There’s enough essential oil in the products to do the job they’re supposed to do which is really refreshing. This is one of the two products in Little Green Radicals’ range which is Soil Association certified and 99.9% organic. This has been really important for the company to achieve and I admire them for this. I wish more companies would look harder at getting their products approved by the Soil Association. Their sleep balm has a lovely familiar aroma of lavender. Nothing overpowering, but gently soothing. Just right for applying to your baby’s skin to encourage a calm, restful, sleep state. Their chest rub is a 100% natural vapour rub with a blend of aromatic rosemary oil & stimulating eucalyptus oil to help you & your family breathe more easily. Soil Association certified, 99.9% certified organic. This is Little Green Radicals’ second Soil Association certified product in the range. It has rosemary and eucalyptus oils in it and again has just enough of the essential oil to be effective without being overpowering. There’s nothing worse that applying a chest rub to your child’s chest and back only to end up with watery eyes because the smell is so potent and overbearing. Like the sleep balm and the petroleum jelly the texture is more like a butter which melts when worked into the skin. They are not greasy and absorb well into the skin. The Nappy Balm and Petroleum-Free Jelly are both £8.95 each for a 50ml pot and the Chest and Sleep Balms are £9.95 each for a 50ml pot. The range has had really good feedback from both the initial testing group and parents who have bought the range since its launch in mid May. I would definitely buy the range and have been suitably impressed. I like the fact that it’s slightly different from other ranges I’ve tried out. In fact I’m impressed that there are an array of free-from skincare products out there both for babies, children, teens and adults which are so different. There really is something for everyone dependent on your personal taste and requirements. If you’d like to find out more then pop across to Little Green Radical’s website for more information on their skincare and clothing ranges. You can also link up with them on Facebook and follow them on Twitter. Don’t forget if you want to be kept informed of new posts, the best way is to follow me on Bloglovin. You can also connect with me on Google+, Facebook and Twitter. Disclaimer: I was given a 15ml sample pot of each product to keep, try out and review for this post. The views, thoughts and opinions expressed are honest, true and my own feelings on these products.